Successfully Added Flexible Multicolor Stick-on LED Strip - Indoor Splashproof, High LED Brightness, 300 LEDs, 5 Meters to your Shopping Cart. Flexible Multicolor 5 meter LED strip with self adhesive tape, approx 300 LEDs and splash-proof coating. This is the perfect LED gadget to decorate your house, stairway, windows, or more! 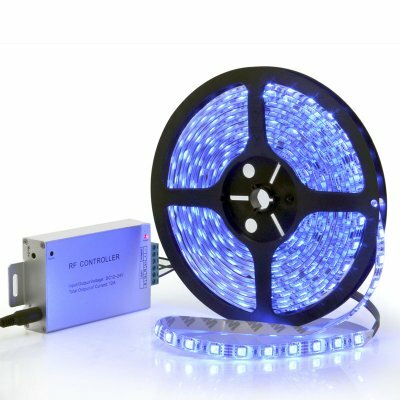 This high quality LED light strip uses new and improved LED technology and features 60 multicolor LEDs per meter. Brighter than ever before, the LEDs are able to be remotely controlled and let you choose between 7 colors including red, green, yellow, blue, purple, cyan-blue and white. Use the remote control to cycle through the preset programs and colors to set the mood you want. 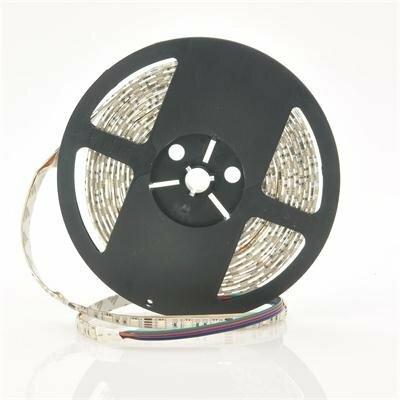 This 5 meter LED strip is extremely flexible and can be bent in any shape, making this product perfect for architectural lightning, display lightning, outdoor use and many other applications.